A couple of weeks back I started seeing a movie title pop up in my social media feeds that I had not heard of before. All of the buzz surrounding it seemed to be pretty popular, but figuring I would never get a chance to see, I did not pay it any mind. Things have a way of changing situations pretty quickly and I did find myself with an opportunity to go see it. The movie is called Train to Busan and it hails from South Korea. Another factor that played into my not really looking into it more quickly is the title, it is not really an attention grabbing title, you know what I mean? Well, then I discovered it was a zombie film and I got a little more interested. I watched the trailer and knew it was something I wanted to see. Now, in the aftermath of seeing it, I am glad I decided to take a peek and make the trip down to see it. This is an exhilarating example of taking a familiar story and making it work. It starts off a little to the slow side, but keeps building and building with relentless fashion, until it has you hooked and on the edge of your seat. There was action, blood, and a great deal of heart. What really makes the movie work so well is the balance of action and horror with the heart and emotional pull. It is not always an easy combination to get, but this film gets it. 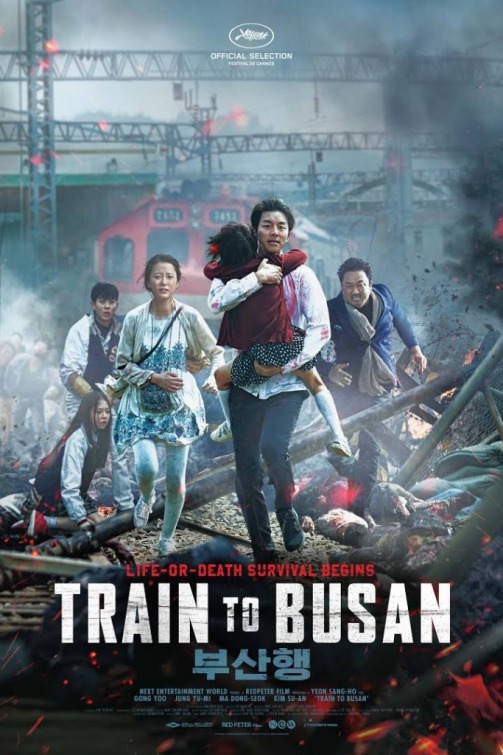 Train to Busan was written and directed by Sang-ho Yeon, making his live action debut. Prior to this, he was an animation director known for films such as Seoul Station, The Fake, and King of Pigs. Now, I have not yet seen any of his animated offerings, but if they are anything like Train to Busan, I think I may have to check them out. 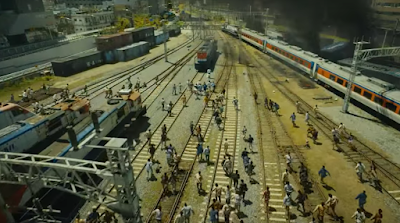 As for this one, I think the easiest way to describe it is to say it is the movie that World War Z wanted to be (and I enjoyed that one), just mix it with some 28 Days Later and perhaps a little bit of Snowpiercer. To be sure, this is not a movie that offers anything really new to the genre. What makes this movie work so good is the pure execution. Telling a familiar story is not always a bad thing, a lot of movies we like and love tell stories that are familiar, what keeps us glued to our seats is the way the story is told, the way the images are shown, how it connects with us on some level. This is where Train to Busan excels. Train to Busan tells the story of a hardworking, well meaning, but neglectful father and his daughter who wants to spend her birthday with her mother. The problem is her parents are separated and to get her to her mother requires taking a train from Seoul to Busan. He eventually agrees to take her. This is where the problems arise. Little do they know that there has been an accident and a zombie outbreak is underway. We watch the father and daughter team with a ragtag group of survivors as they fight their way through train stations, train cars, and each other in an attempt to come to grips with what is happening and to avoid being eaten. It is a rather thrilling film that builds in its relentlessness. Amidst the thrilling zombie action, there are also some very human story threads that pull at your heart and beg for an emotional investment. I know I am not telling that many specifics, but really, the story is so familiar, you probably know what is happening. What you will want to see it for is the details. The characters grow and develop, revealing themselves to the audience, there are some interesting touches and ideas used with the portrayal of the zombies, and there is some nice technical work as well. Train to Busan is a special film. It is a movie that draws you in and holds you in its clutches all the way through. It takes the fact you are familiar with the formula and uses that to toss in the human story, the drama, the real reason to watch and just keeps you on the edge of your seat. It is a truly fantastic zombie film that deserves to be seen, on the big screen if you can.